Barbie is no longer the less-than-intelligent blonde she once was, now earning her keep as a professional geek. Barbie has had over 100 careers since 1959, taking on the work of firefighter to astronaut, and Mattel has just revealed her latest. Barbie's 126th career will be computer engineer, establishing her as an official nerd. 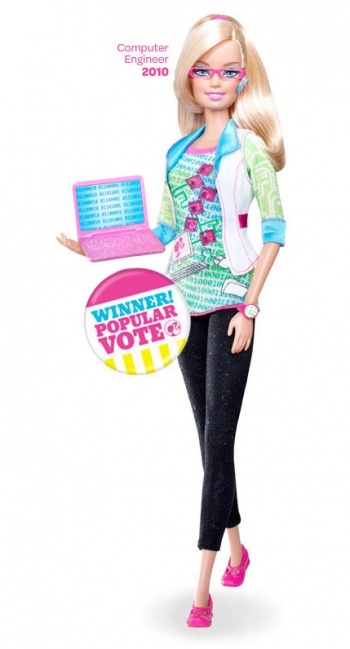 Computer engineer was chosen by the popular vote of over 500,000 people; the first time Barbie's career has ever been decided this way. Other choices included architect, environmentalist, news anchor, and surgeon, with news anchor set for Barbie's 125th career as it won the popular vote amongst girls (take that, guys). In the field of computer engineering, men often outnumber women, so the hope is that the doll will help to inspire young women to become code monkeys. Computer Engineer Barbie is set to make her programming debut in Fall 2010. She'll be wearing a binary code t-shirt, carrying a smart phone, and talking to her corporate drone boss on a Bluetooth headet. Just because Barbie is a computer engineer doesn't mean she can't still accessorize, as her hot-pink glasses will match the hot pink laptop she stares at for 10 hours a day. Computer Engineer Barbie is supposedly available for pre-order at the Mattel shop, but I couldn't find the link, so maybe a more enterprising Barbie fan can discover how to reserve one. Escapist News Correspondent apparently has a shot at becoming Barbie's 127th career, which will come complete with padlocked cage and bathroom bucket. Seriously, someone help me.